The iMac (27-inch, 3.06GHz Intel Core 2 Duo, Late 2009) introduced in late 2009 is the all-in-one desktop computer in an all-aluminum unibody casing behind the 27-inch LED-backlit IPS screen, covered by an edge-to-edge front glass and mounted on an aluminum stand with a slightly tapered foot and an adjusting hinge. It is almost identical to iMac (21.5-inch, 3.06GHz Intel Core 2 Duo, Late 2009) in everything but the screen dimensions. The iMac (27-inch, 3.06GHz Intel Core 2 Duo, Late 2009) features a 3.06 GHz Intel Core 2 Duo processor (E7600), with two independent processor “cores” on a single silicon chip, 4 GB of RAM, a 1TB Serial ATA hard drive (7200 RPM), a slot-loading DVD+R DL “Super Drive”, Radeon HD 4670 graphics with 256 MB of memory shared with the system, or ATI Radeon HD 4670 graphics with 256 MB of shared memory, a built-in iSight webcam and stereo speakers, as well as a Firewire “800” and 4 USB 2.0 ports. It also has built-in draft and enabled AirPort Extreme (802.11g) and Bluetooth 2.1+EDR, Gigabit Ethernet and Mini DisplayPort capable of supporting a second display. The cooling system is CPU controlled and the in-built speakers are mounted beneath the 27-inch screen for the clearer less distorted sound to bounce off the desk or other surface. The speakers’ grills also work as the vent ones. The iMac (27-inch, 3.06GHz Intel Core 2 Duo, Late 2009) is shipped with a compact aluminum Apple Wireless Keyboard and a new multi-touch “Magic Mouse”, an aluminum remote control is optional and available for an extra cost. Graphics: Radeon HD 4670 graphics with 256 MB of memory shared with the system. Apple Model No: A1312 (EMC 2309). The Unibody iMac of later 2009 got a SD memory card reader. SD stands for Secure Digital, it’s a non-volatile memory used in portable devices such as photo and videocams, cell phones and laptops. Though the SD card was introduced in 1999 it took a card reader ten years to appear on iMacs. Switching to a new iMac or another device? 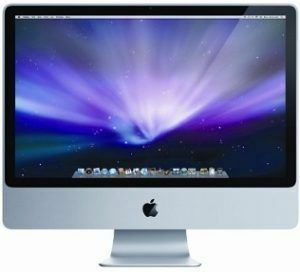 Sell your old model to iGotOffer for the best price online: Sell iMac now. I’ve sold you my 10 years old iMac 27″, the same model that this one. I appreciate your customer service and the price you were ready to pay for such an old machine.